Thicker Than Water is the final instalment of Georgia Rose’s The Grayson Trilogy. As a massive fan of the first two novels, it was with a mixture of excitement and trepidation that I approached this story. On the one hand, I couldn’t wait to find out what was happening to the central characters, Emma and Trent, along with the finely crafted supporting characters but, on the other, did I really want my investment in their world to be over? I needn’t have worried because Rose rewards her readers with the most satisfying finale to what has been a captivating trilogy. One of the strengths of these stories is their refusal to be pigeon holed into any particular genre and Thicker Than Water has something to offer most readers. It’s part love story, part family drama, part suspense with a big pinch of action adventure thrown in for good measure. The story opens with Emma and Trent settling into domesticity as a married couple. When Emma finds herself pregnant, readers of the earlier stories will understand why the news provokes a complex reaction in her. As she and Trent work through the emotional turmoil, Rose manages to create even more depth to their characters and relationship. For me, one of Rose’s skills is the way she is able to describe the everyday parts of life with an authenticity that we can all relate to. The novel changes pace about a quarter of the way in with the arrival of a mysterious package which brings a new character – Zakhar Volkov – into Emma’s world, with life changing ramifications. As Trent and Cavendish are still dealing with the fallout of their run in with the Polzin family in Before The Dawn, the situation travels full circle back to the Manor with dire consequences. It is during the resolution of this dispute that we are taken on a rollercoaster ride of action adventure with real moments of ‘edge of your seat’ tension. What I like about Thicker Than Water is the fact that as well as being a page turner it raises many philosophical issues. Perhaps most importantly it explores the idea of whether we need to know our past before we can successfully embrace our future. Emma has had a troubled life with a childhood spent in foster care. Rose uses this novel to allow Emma to make peace with both her childhood and the death of her first child. I also found myself pondering the rather timely question of whether there’s a place for an intelligence service operating with few limits in a world threatened by terrorism and other dangerous criminal enterprises. The introduction of Volkov, who is an assassin, raises questions of morality as he only kills people who are bad and seemingly deserve it. This moral dilemma becomes even thornier when Trent likens his own role to that of Volkov. Rose doesn’t give us simple answers and this lends the novel a sense of gravity. 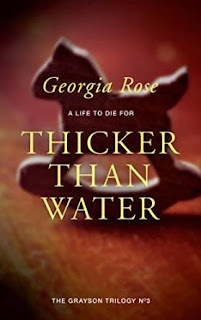 Thicker Than Water could be enjoyed as a standalone novel but to get the maximum enjoyment I would recommend it to be read as part of the wonderful Grayson Trilogy. If you want a novel that will make you feel as though you are actually a part of this mysterious, thrilling world then give yourself over to Georgia Rose. Be warned though set aside a good few hours reading time because, once you start reading, you won’t want to put this book down.